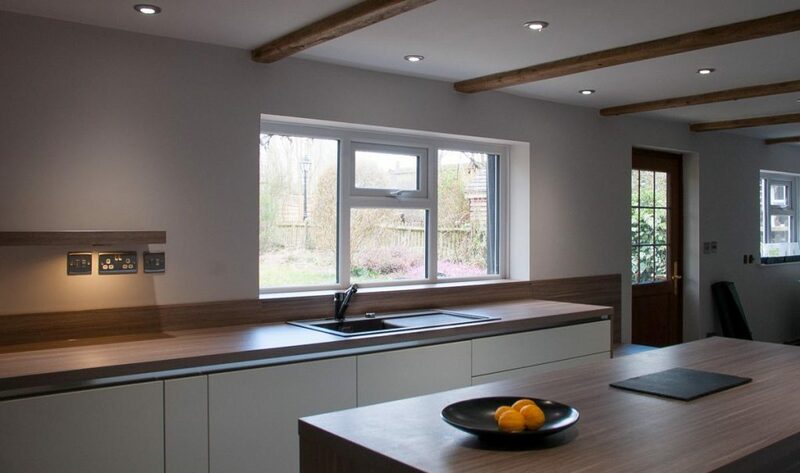 To be installed in a period cottage our clients were after a modern, handle-less kitchen that would sit comfortably in the space without dominating it. 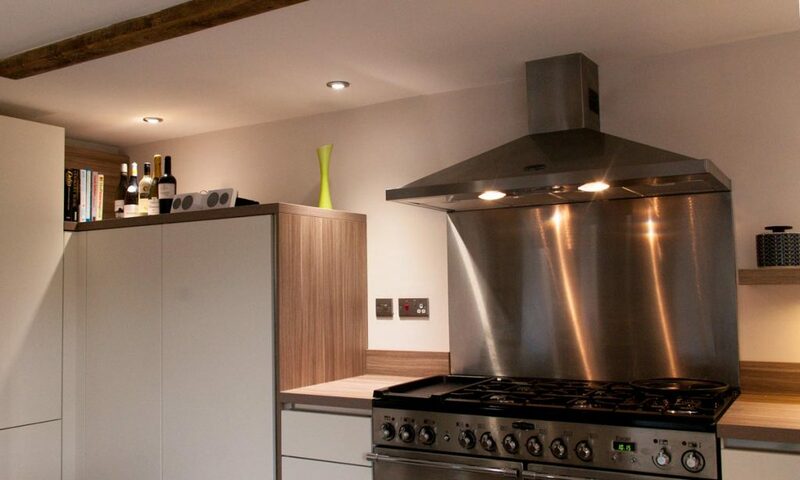 Being keen cooks the “must haves” included a range cooker, an island and lots of storage and worktop space. The space lent itself to a simple L shaped design wrapped around the island. With low ceilings the decision not to have any wall units kept the space feeling as light and spacious as possible. Mirroring the base units, a simple L shaped shelf, complete with LED down lights, added not just some useful storage, but some nice ambient light. To the left of the range cooker a small midi height fridge, corner larder cupboard and boiler housing make the best use of this quirky corner space. The run of base unit cabinetry delivers further functionality, with bins, dishwasher, freezer and drawers all delivering exactly what’s needed exactly where it’s needed. The bench height drawer unit softly finishes the run and creates a nice little spot for an impromptu rest. The desire to mix the old and with the new is something we see more and more. Gone are the days when an old, period house, meant an old style kitchen. 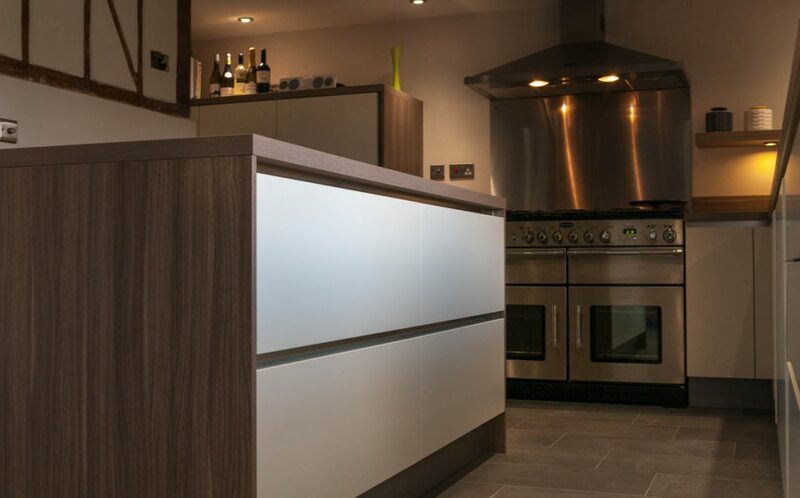 Contemporary kitchens, and crucially, the soft satin lacquers available now, mean these kitchens look far from garish or out of place. Instead they create a wonderful mix that can actually enhance the original space, offering a contrast that really brings the room to life. 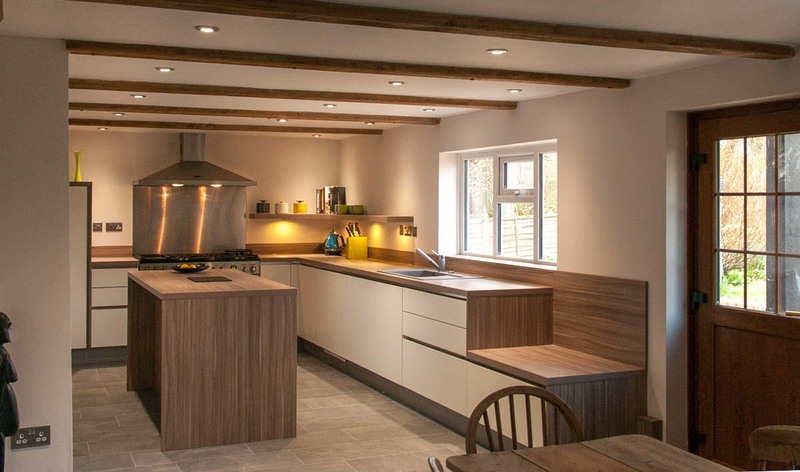 This kitchen uses the soft, warm tones of the Stone Oak to further soften the edges and ease the wonders of a 21st century German kitchen into the 250 year old house. We love how it well it works!